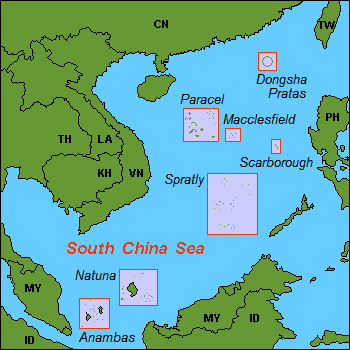 Boxed areas contain islands claimed by China. China’s state media said the government plans to put offshore nuclear-power platforms to promote development in the South China Sea. Such a development could make it much more difficult to militarily stop the increasingly aggressive and expansionist regime in Beijing because of the threat to the environment. China could essentially hold the entire sea and its neighbors hostage. The announcement came only a few days after an international court ruled that Beijing had no historic claims to most of the waters of the sea, which most of the world considers international waters and through which 30 percent of global trade passes. Sovereignty over the South China Sea is contested by China, the Philippines, Vietnam, Malaysia, Brunei and Taiwan. To read the article on this development, please hit this link.